SUBHEAD: Zbigniew Brzezinski, architect of US hegemony, gives up on American Empire. 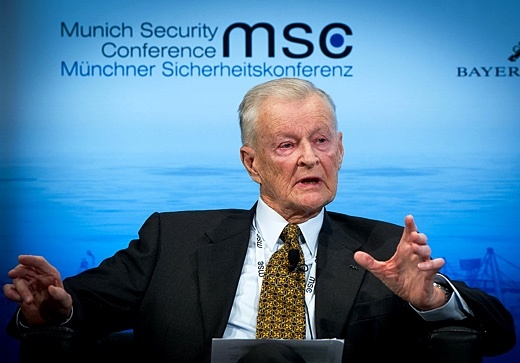 Image above: Zbigniew Brzezinski (Former United States National Security Advisor; Counselor and Trustee, Center for Strategic and International Studies) at the 50th Munich Security Conference 2014. From original article. This is why Brzezinski has done a quick 180 and abandoned the plan for US hegemony; it is because he is concerned about the dangers of a non-dollar-based system arising among the developing and unaligned countries that would replace the western Central Bank oligopoly. If that happens, then the US will lose its stranglehold on the global economy and the extortionist system whereby fishwrap greenbacks are exchanged for valuable goods and services will come to an end. “As the war in Iraq winds down and America begins to withdraw its forces from Afghanistan, the United States stands at a pivot point. Over the last 10 years, we have allocated immense resources to those two theaters. In the next 10 years, we need to be smart and systematic about where we invest time and energy, so that we put ourselves in the best position to sustain our leadership, secure our interests, and advance our values.